Search a wide range of indoor and outdoor settings for your group event. Biltmore’s 8,000-acre estate offers countless venues – from gardens to boardrooms to banquet halls. 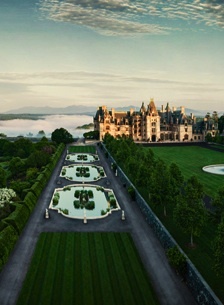 Formal in design, this elegant garden is just steps away from Biltmore House. With three symmetrical pools, grassy panels, and Italian sculpture, it provides both privacy and convenience for dinners, receptions, and social events. The unexpected is also easy to find on the estate. Our Lagoon provides a shady spot alongside the French Broad River with an amazing view of Biltmore House in the distance. What a grand place for al fresco lunches; you can combine it with nearby fields to create an ideal location for outdoor activities suitable for all ages. Enjoy sweeping panoramic view of the Blue Ridge Mountains from this terrace adjoining Biltmore House. An arbor of fragrant wisteria and vibrant trumpet creeper make this venue an exclusive spot. Located just outside of Lioncrest Chestnut Room, the Courtyard provides 830 square feet of private, open-air space. Retractable awnings make it perfect for a reception or a fresh air break. Can only be booked with the Chestnut Room. Featuring three walls of floor-to-ceiling windows looking out into both a forest and an open-air courtyard, the Veranda is a space filled with natural light. Hundreds of twinkling lights make this venue magical—perfect for evening receptions, dinners, and gatherings. Audiovisual capabilities and high-speed internet access are available. Located next to Biltmore House, this four-acre elevated terrace space hosts our annual Biltmore Concert Series, providing incomparable views of the surrounding mountains. It has served as an extraordinary location for seated dinners and dancing beneath the starry mountain sky. More than a century ago, George Vanderbilt entertained guests with a game of tennis on the grassy spot below the Italian Garden. Today, your guests can enjoy a view of Biltmore House while admiring the gardens.